Who are the leading companies in the SSLNG industry? What is the total size of the SSLNG market in 2019? How much will it grow and why? What political, economic, environmental and technological factors affect the SSLNG market? This independent, 143-page report guarantees you will remain better informed than your competitors. With 106 tables and figures examining the companies within the SSLNG market space, the report gives you an immediate, one-stop breakdown of the leading Small-Scale LNG companies plus analysis and future outlooks, keeping your knowledge one step ahead of your rivals. This report is essential reading for you or anyone in the oil or other industries with an interest in LNG. Purchasing this report today will help you to recognise those important market opportunities and understand the possibilities there. 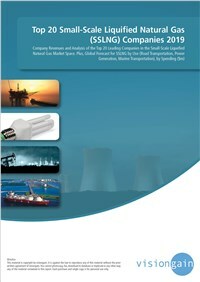 Order our Top 20 Small-Scale Liquified Natural Gas (SSLNG) Companies 2019: Company Revenues and Analysis of the Top 20 Leading Companies in the Small-Scale Liquefied Natural Gas Market Space. Plus, Global Forecast for SSLNG by Use (Road Transportation, Power Generation, Marine Transportation), by Spending ($m).